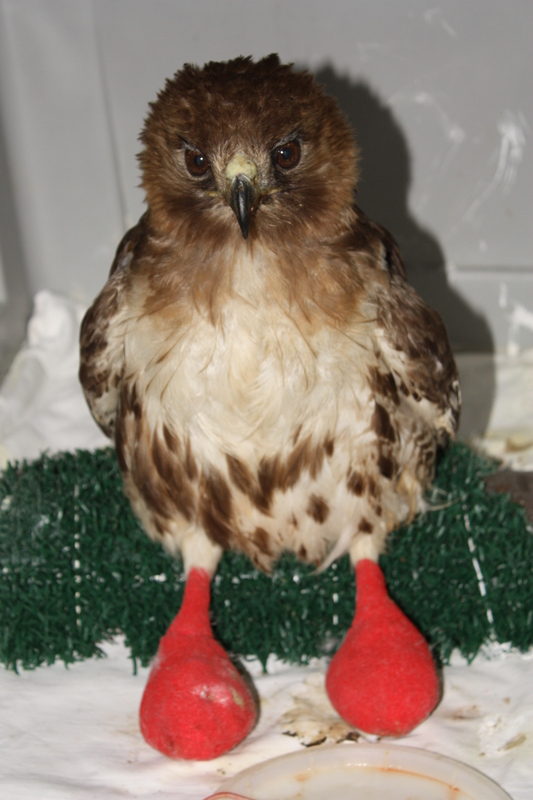 “Bumble”, an adult red-tailed hawk, was found on the ground at Dickerson Power Plant in Dickerson, MD on July 27, 2010. She had severe chronic infections in both feet (called “bumblefoot”), and all her tail feathers were broken. 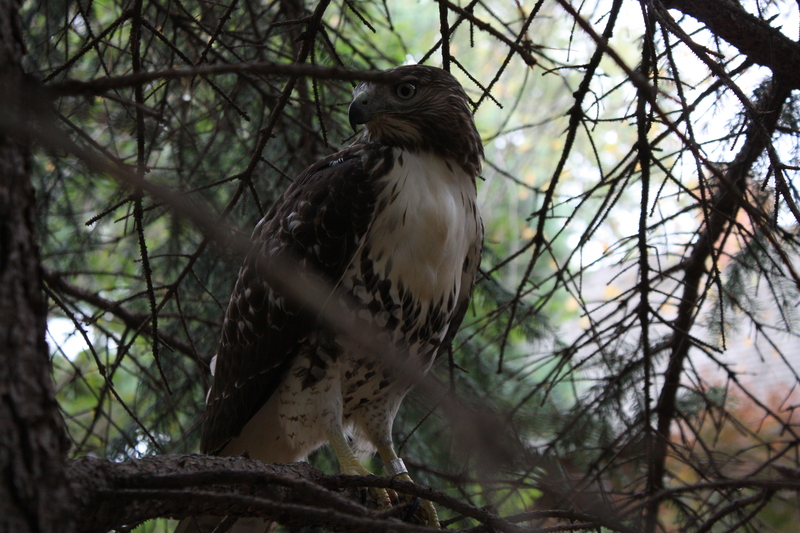 She couldn’t fly or hunt and was severely emaciated and dehydrated. Though these problems can occur in the wild as a consequence of squirrel bites, they can also result from inappropriate perches, caging, and poor husbandry in captivity. It is possible that Bumble had recently escaped or been released from such an environment. Weeks of nursing care were required to clear the infections in her feet, and she needed to complete a molt to replace her tail feathers. Her muscles were reconditioned for flight by increasingly frequent and long flight exercise sessions over several weeks using a creance line. She returned to the wild on March 2011. Iggy with a bandaged wing. Photography by Suzanne Shoemaker. “Iggy,” an adult male bald eagle was rescued from entanglement in an electric wire fence on a farm in Accokeek, MD on January 16th. The wire snared him between feathers of his right wing at the “elbow”. His ensuing struggle to free himself caused severe wounding of that wing. Sadly, despite intensive wound care over several weeks, the wing could not be saved. Circulation to the tip was compromised; therefore the wing required amputation near the elbow. After recovering from surgery, Iggy was transferred to the Salisbury Zoo in Salisbury, MD, where he now resides with another adult male bald eagle in a large enclosure. He is well fed and cared for, and latest reports are that the two are getting along famously. 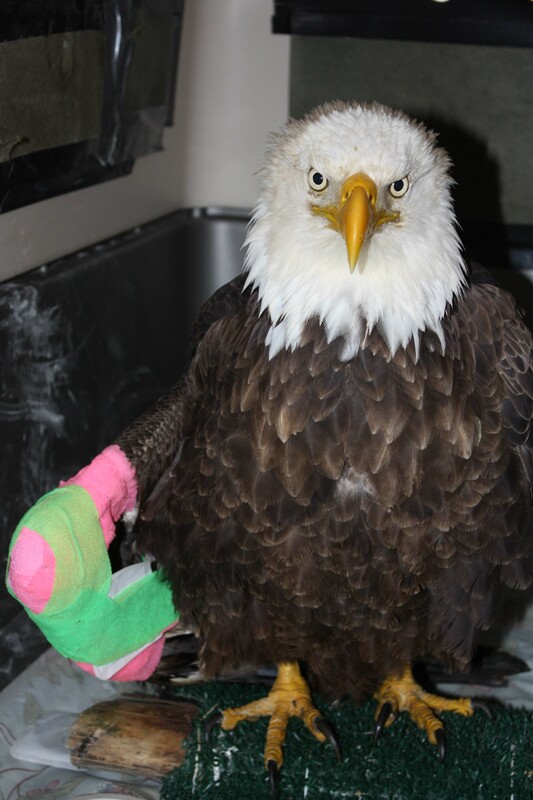 Iggy’s life will now serve to educate people about bald eagles and the hazards they face.